This is the best truck for you if you need a rig that hauls trees, pulls out their stumps, and accommodates six adults in spacious comfort. 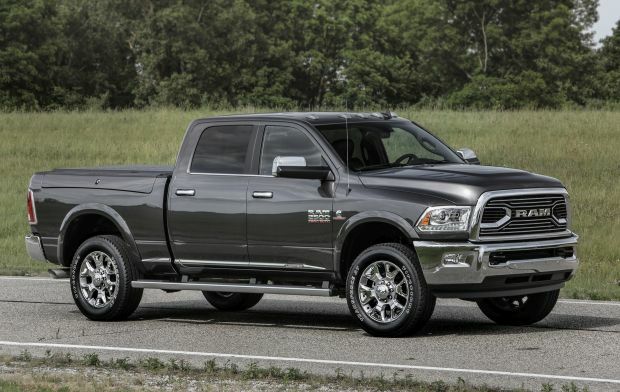 This review covers the heavy-duty 2500 and 3500 series produced by the Ram division of Fiat-Chrysler Automobiles (FCA). These three-quarter and half-ton models, respectively, are for people who need more towing and payload than available in the lighter-duty half-ton Ram 1500 line. Trucks of all sizes are shifting upmarket in features and price. Their manufacturers are in a game of constant one-upsmanship to create the most capable and most luxurious pickups on the market. Among the most sybaritic, General Motors has the Chevrolet Silverado HD High Country and GMC Sierra HD Denali, which haven’t been redesigned for several years. Ford recently launched the new top-line F-Series Super Duty Limited, some configurations of which can carry a sticker price approaching $100,000. For model-year 2018, FCA is introducing its own new heavy-duty flagship, the Limited Tungsten, which is mainly an appearance package designed to give the truck an even more high-end feel. Like its rivals, FCA does not separate heavy-duty and light-duty sales figures. Sales for the Ram brand, which includes pickups in a variety of weight classes, rose 2 percent in calendar 2017 to slightly more than 500,000. That was good enough for third place behind the F-Series and Silverado. Should you buy a 2018 model, or wait for the ’19? No reason to wait. While FCA will launch a redesigned Ram 1500 for the 2019 model year, the holdover heavy-duty variants should soldier on with minimal changes. The next-generation Ram 2500 and 3500 trucks will arrive for model-year 2020 or ’21, depending on the industry source doing the prognosticating. The current 2500/3500 models debuted for 2009, but their styling and engineering have held up extremely well. Their stat sheet won’t show payload or towing capacities to match those of the Ford and GM rivals. When rubber meets the road, however, Ram tops them for drivability, ride quality, passenger comfort, and overall user friendliness of the interior. The model roster and feature sets of the Ram 2500 and 3500 generally mirror one another. They start with the entry-level Tradesman and ascend through SLT, Big Horn (called the Lone Star in Texas), Laramie, Laramie Longhorn, and Limited. Exclusive to the 2500 is the off-road-optimized Power Wagon, a trail-conquering monster that slots between the Laramie and Longhorn. Three body styles and two bed lengths are available, depending on trim level. Tradesman and SLT grades offer a two-door Regular Cab that teams with an 8-foot-long cargo bed. All models are available as a four-door Crew Cab with a 6-foot, 4-inch bed. The Crew Cab is also available with an 8-foot bed (on all except the Power Wagon). 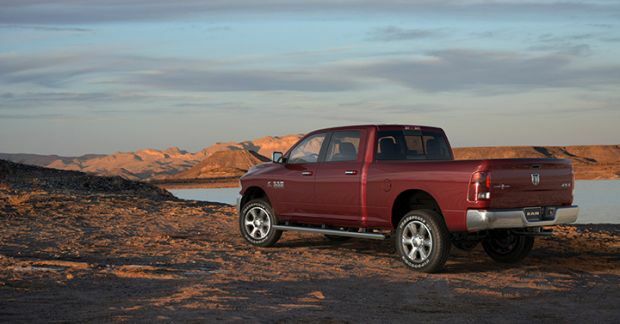 All but the Tradesman and Power Wagon can be equipped with Ram’s exclusive “Mega Cab” with the 6-foot, 4-inch bed. The Mega has longer rear doors than the conventional crew and its rear seats recline and provide 3 more inches of rear legroom. Engine choices consist of two gasoline V-8s and a turbodiesel inline 6-cylinder. The latter is the only engine in a full-size truck of any stripe that can be paired with a manual transmission. Most models come with rear-wheel drive. Standard on the Power Wagon and optional on the others is four-wheel drive (4WD) that includes low-range gearing for off-road use. As opposed to the 4WD and all-wheel-drive systems available in the half-ton class, the heavy-duty Rams have old-school part-time 4WD, which is not designed to remain engaged on dry pavement. Both Single-Rear wheel (SRW) and Dual-Rear Wheel (DRW) configurations are offered on the 3500. 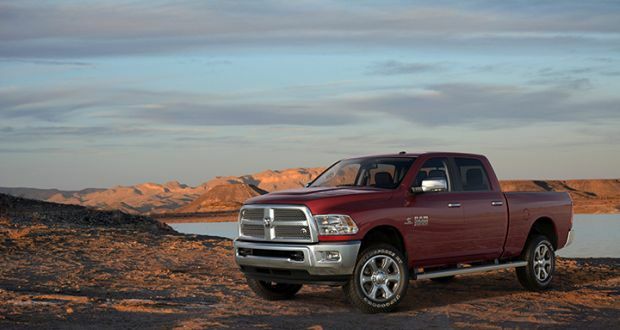 Styling: Ram 2500 and 3500 share their brawny, yet handsome looks with the smaller 1500. All were last updated for the 2013 model year. Most grades use the brand’s “crosshair” grille design with the Ram insignia in the middle. Laramie Longhorn, Power Wagon, and Limited versions exchange that for a face with horizontal bars and the word “RAM” stamped boldly in the middle. The Power Wagon is serious about going off-road, with chunky tires, unique wheels, roof lights, underbody skid plates, and tubular running boards. Mounted inside the front bumper is a 12,000-pound electric winch with a 90-foot cable. Cabin décor ranges from basic-but-functional in the Tradesman to hunt-club opulent in the Limited. The Power Wagon offers high-end creature comforts, such as leather upholstery with contrast piping, heated and ventilated front seats, and a heated steering wheel. What it doesn’t have is dashboard-switch-controlled electronic transfer case to change between 2WD and 4WD. Instead, it has a thick floor lever to engage 4WD and 4WD low-range. Anachronistic or classic? You decide. Despite being heavy-duty haulers through and through, all these Rams are supremely comfortable. The seats are highly supportive. Headroom is vast. Even conventional Crew Cab models have generous rear-seat legroom. Speaking of the rear seat, that’s where you’ll want to be in the Mega Cab. With up to 43.3 inches of legroom (the front seats “only” have 41 inches) and reclining backs, this is most accommodating rear seat of any pickup truck. There’s also ample room for your gear. Big door pockets, two gloveboxes, and a gigantic center console make short work of small-items storage. On models with rear seats, you can flip up the bottom cushions and flip out a handy carpeted tray that’ll hold stuff you don’t want on the (muddy, sandy, dog-hair-coated) floor. Also available is FCA’s RamBox Cargo Management System, which includes a pair of lighted, lockable storage bins that run along the bed rails, a bed extender and divider, bed tie-down rails, and very useful LED cargo-box lighting. The RamBox bins can be cleverly integrated with the available remote entry system so owners can lock and unlock them with a fob rather than a separate key. 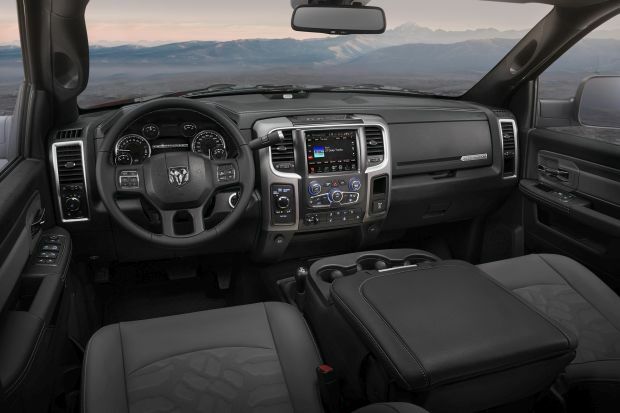 You can equip a Ram 2500 or 3500 with the brand’s Uconnect 4 infotainment system that includes support for imbedded GPS navigation, Apple CarPlay, and Google Android Auto. It’s just as easy to use here, but it comes something you won’t find on other FCA vehicles: discrete buttons for the available heated/ventilated seats and heated steering wheel. Models such as the Jeep Compass and Grand Cherokee require you to interact with the Uconnect touchscreen to control theirs. You can still do this on the Ram, but there’s no reason to do so because the buttons are within easy reach. Ram’s instrument cluster is not quite as comprehensive as that of the Ford Super Duty, but it gets the job done. You can find two USB power points inside the center console, and these are available to Uconnect for CarPlay and Android Auto. There’s another USB connection on the lower-right of the central dashboard stack, but it delivers power only. This is a nitpick, but we wish this port were part of the infotainment system as well. And larger outside mirrors would boost our confidence when changing lanes. Mechanical: Standard on 2500 and SRW 3500 Tradesman, SLT, and Big Horn/Lone Star is FCA’s 5.7-liter “Hemi” V-8 engine, producing 383 horsepower and 400 pound-feet of torque. Optional on these models and standard on the Power Wagon, Laramie, Longhorn, Limited, and 3500 DRW is a 6.4-liter “Hemi” V-8. It produces 370 horsepower in the 3500 with Mega Cab and 410 otherwise. Torque is the same across the board at 429 pound-feet. The sole transmission for all gas models is a 6-speed automatic. Ram’s diesel engine offering is a 6.7-liter inline 6-cylinder produced by Cummins. There are three versions. One pairs with a 6-speed manual transmission and makes 350 horsepower and 660 pound-feet of torque. The other two have a 6-speed automatic. On the 2500, output is 370 horsepower and 800 pound-feet of torque while the 3500 has 385 horsepower and 930 pound-feet. Maximum towing capacity is 17,980 pounds for the 2500 and 31,210 for the 3500. Maximum payloads are 3,890 pounds for the 2500 and 7,390 for the 3500. Our most recent test of a heavy-duty Ram was a Power Wagon. The 6.4-liter V-8 furnishes decent but not earth-shattering acceleration in this heavy truck. The automatic transmission shifts smoother than the one in the Ford Super Duty we also evaluated, though to be fair, that F-250 was a diesel. The Power Wagon’s engine is quite loud, both at idle and during acceleration. This model comes equipped with off-road-biased tires that roar on all types of pavement. They also dull steering feel to the point where you must regularly make small corrections to maintain a straight line, especially in gusty crosswinds. FCA touts the Power Wagon as “…the most capable production off-road pickup.” Some would argue that title belongs to the Ford F-150 Raptor. In the wide-open spaces of Moab, Utah, the Power Wagon can certainly bash rocks with the best. However, its sheer size could be problematic if you need to traverse the woods to get to your favorite hunting grounds. Ride quality is a highlight on the 2500. These models have a five-link coil spring rear suspension (3500 models use a traditional leaf spring arrangement). This setup results in little to no rear-end tail hop when the bed is empty. Despite its off-road intentions, the Power Wagon is much more refined than you would expect on-road. An air suspension is available on the 2500, which should make things even smoother. Features: As with other large trucks, the Ram 2500 and 3500 are as basic or as luxurious as you want them to be. The Tradesman is a rig designed for work; you can get one with manual locks and windows if you so desire. With thousands of possible combinations of features, we’ll only touch on the highlights. Dual-zone automatic climate control is standard on Laramie and above and optional on all but the Tradesman. Power-adjustable pedals are optional on the SLT, Big Horn/Lone Star, and Power Wagon. A version that works with a driver-seat memory function is optional on the Power Wagon and Laramie and standard on the Longhorn and Limited. Heated front seats are standard on the Laramie and above and available on the Big Horn/Lone Star and Power Wagon. Ventilated front seats are optional on the Power Wagon and above, while heated second-row seats are available on Crew and Mega Cab versions of the Laramie, Longhorn, and Limited. The Tradesman has vinyl upholstery with optional cloth. SLT and Big Horn/Lone Star include cloth. Standard on the Power Wagon is a cloth/vinyl blend. Leather seating surfaces are optional on the Big Horn/Lone Star and Power Wagon and standard on the Laramie. The Longhorn has upgraded leather while the Limited uses high-end Natura-branded hides. A rearview camera is standard across the board. A separate cargo-view camera is optional on models equipped with the available 8.4-inch Uconnect infotainment system. Buyers in colder climates can order a 2500 or 3500 with preparations in place to accommodate a snow plow and/or in-vehicle telematics. Where the Ram is a bit behind the times is in terms of driver-assistance features. Front- and rear-obstacle detection are available, but items such as radar cruise control, blind-spot alert, forward-collision warning, and autonomous emergency braking are not. Base prices for the 2018 heavy-duty Ram line, including the $1,395 destination fee, range from $33,940 for a rear-drive Tradesman 2500 Regular Cab to $65,390 for a 4WD Limited 3500 Mega Cab. 4WD adds $805-$3,200 depending on trim level, cab, and bed selection. Instead of listing every individual option for each trim level, we will price out the version we think is the best value, along with some other options you might want to consider. Our pick would be the 4WD 2500 Laramie Crew Cab with 6-foot, 4-inch bed, which has a starting price of $52,340. Consider adding the $145 Protection Group (skid plate for the transfer case and tow hooks) as well as the $395 Convenience Group (automatic high-beam headlights and rain-sensing windshield wipers). The cargo-bed camera is $345, and LED bed lighting is $165. We would also recommend the $695 running boards because step-in is quite high on these trucks. For convenience, we suggest the $745 imbedded navigation system, $195 rear window defroster, $195 power-adjustable pedals with memory, $245 remote engine start, and $195 pushbutton ignition. That brings the total sticker price to $55,660. Other convenience and mechanical highlights include a power sunroof ($1,095), Sport Appearance Group ($1,895), Off-Road Package ($445, which includes an off-road suspension, hill-descent control, tow hooks, and skid plates), 5th Wheel/Gooseneck Towing Prep Group ($445), air suspension ($1,595), high-capacity alternator ($100), dual alternators ($395), and of course, the Cummins turbodiesel engine ($8,700). The Limited’s Tungsten Edition Package is $1,395. The EPA doesn’t require these trucks to go through its fuel-economy rating program. That might be a good thing: our Power Wagon returned a dismal 11.2 mpg in our suburban test loop. The 6.4-liter gas engine uses regular-grade 87-octane fuel. FCA recommends mid-grade 89-octane for the 5.7-liter V-8. The turbodiesel requires ultra-low-sulfur fuel. It also uses an exhaust treatment fluid to comply with U.S. emissions standards. We recommend purchasing the replacement fluid from your dealer, but topping it off doesn’t require you to visit the service department. Expect little in the way of major updates to these trucks. The next-generation Ram heavy duty will likely debut for model-year 2020 or 2021. Hopefully they will be brought up to date in terms of driver-assistance features. We don’t think their engines will change much, but we would like to see them adopt FCA’s excellent 8-speed automatic transmission that would allow for better throttle response and fuel economy.